The Holiday Inn Express Raleigh East Hotel takes pride in its unique decor and personal attention to detail. We offer free local calls, delicious Express Start Breakfast Bar, 24hr. 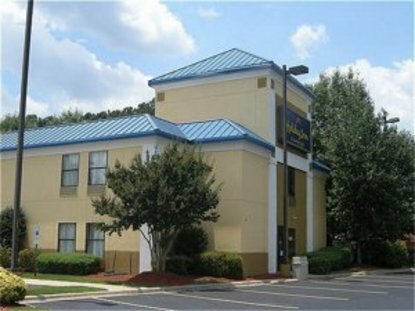 Front Desk Attendant, safe deposit boxes at the Front Desk, in room telephone data-port, well lit parking lot and fitness room. We also provide a hair dryer, coffeepot/coffee, iron /ironing board, microwave, and refrigerator in every room. Suites with whirlpool tubs are available. Guest comfort and satisfaction are our priorities. Our central and convenient location close to downtown Government Buildings, restaurants, theatres, sports venues, museums and just 22 miles to the airport. This hotel is committed to providing accessible facilities under the American Disabilities Act. If your accessibility needs are not met, please contact the Hotel Manager on Duty. Should you require additional information regarding accessible facilities for guests with disabilities, please call 1-800-Holiday (U.S. and Canada) or contact the hotel directly. For the hearing impaired, TDD service is available at 1-800-238-5544 within the U.S. and Canada.